Located in a menacing, gothic landscape, the poems that comprise A Woman of Property draw formal and imaginative boundaries against boundless mortal threat, but as all borders are vulnerable, this ominous collection ultimately stages an urgent and deeply imperiled boundary dispute where haunting, illusion, the presence of the past, and disembodied voices only further unsettle questions of material and spiritual possession. This is a theatrical book of dilapidated houses and overgrown gardens, of passageways and thresholds, edges, prosceniums, unearthings, and root systems. The unstable property lines here rove from heaven to hell, troubling proportion and upsetting propriety in the name of unfathomable propagation. Are all the gates in this book folly? Are the walls too easily scaled to hold anything back or impose self-confinement? What won't a poem do to get to the other side? 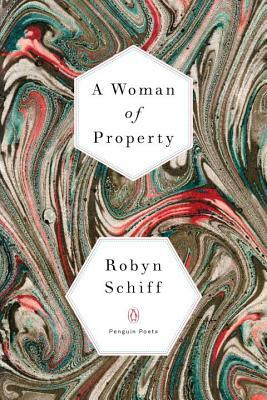 Robyn Schiff is the author of Revolver and Worth (both published by the University of Iowa Press), and the chapbook Novel Influenza (The Catenary Press). Schiff's poems have appeared in The New Yorker, The New Republic, Boston Review, Poetry, and elsewhere. Schiff is a co-editor at Canarium Books and she teaches poetry at the University of Iowa.